We eat a lot of raw food here at the Outpost, through no concerted efforts other than we really love fruits and vegetables, and we happen to be fortunate enough to live in a place where terrific produce is available year round. The thing, is, though, that most of our raw cuisine consists of smoothies, salads, nuts, and crudités. Not exactly blog worthy cuisine, eh? There are also some really great raw food blogs out there. I happen to have a few of the items that make the more involved raw food recipes easier to prepare: a food processor, a blender, and a food dehydrator. (If you do not have a dehydrator, you can still make lots of the recipes that require one by using your oven on a low temperature. I would not recommend this for the recipes that require long hours in the dehydrator, but for shorter drying times – such as the burger recipe below – I think it would be just fine.) I do not have the other appliance that would round out the-well stocked raw kitchen: a juicer. When necessary, I get around that by purchasing fresh juice from one of our island natural food stores when a recipe requires it. Earlier this week I was reading The Sunny Raw Kitchen and was intrigued by Carmella’s post about some jalapeño burgers she recently made. The recipe was originally posted here. I made some modifications to the recipe and my modifications to the recipe are posted below. 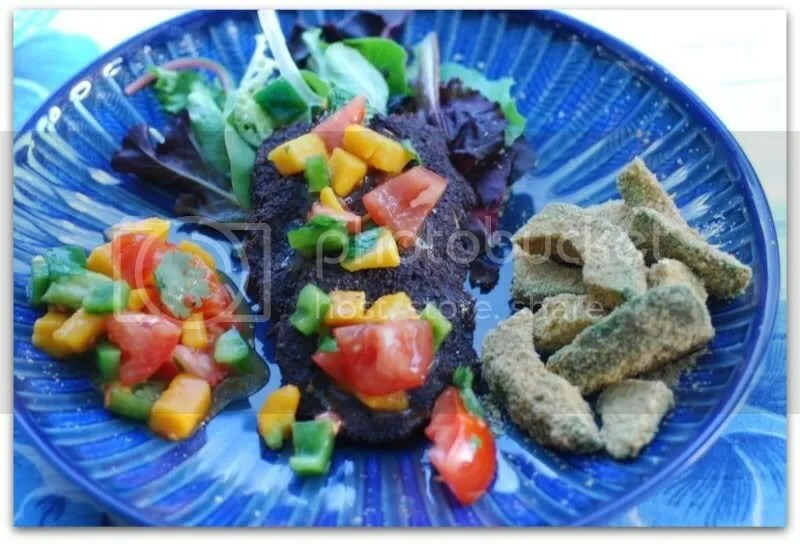 She had paired her burgers with these avocado fries and I did not see reason to mess with a formula that seemed pretty sure-fire (and I happen to love avocado), so I made those, as well, and followed the recipe with no modifications. To top off the burgers and avo fries, I made a simple mango salsa, which was absolutely delicious, and the recipe is also posted below. Raw food is fresh, delicious, and great for you. I am impressed by raw foodists and chefs who do it so well because I think they exhibit a wonderful creativity and imagination in the kitchen. I am not going to be giving up my baked cupcakes or tofu anytime soon, but it’s all about a healthy balance, no? 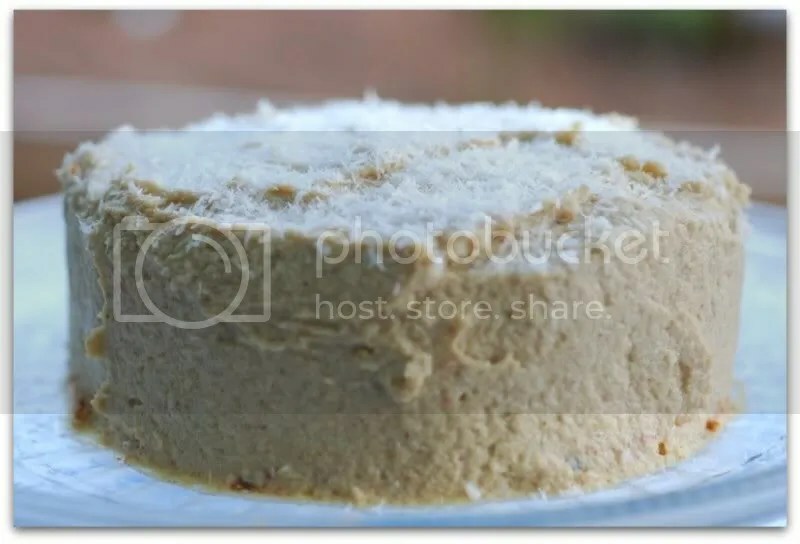 For those of you who need further convincing on this whole raw food thing, just scroll down to see the raw carrot cake I made from Living Cuisine … absolutely divine, I tell you ….. In a food processor, combine all ingredients and process until you achieve a thick, paste-like consistency. Be sure to scrape down the sides during processing to ensure that all ingredients are well incorporated. Remove from processor. Shape into small patties. Place patties onto a teflex-lined dehydrator tray. Dehydrate at 115F for 2 hours. Flip the patties onto the dehydrator screen for an additional 2 hours. 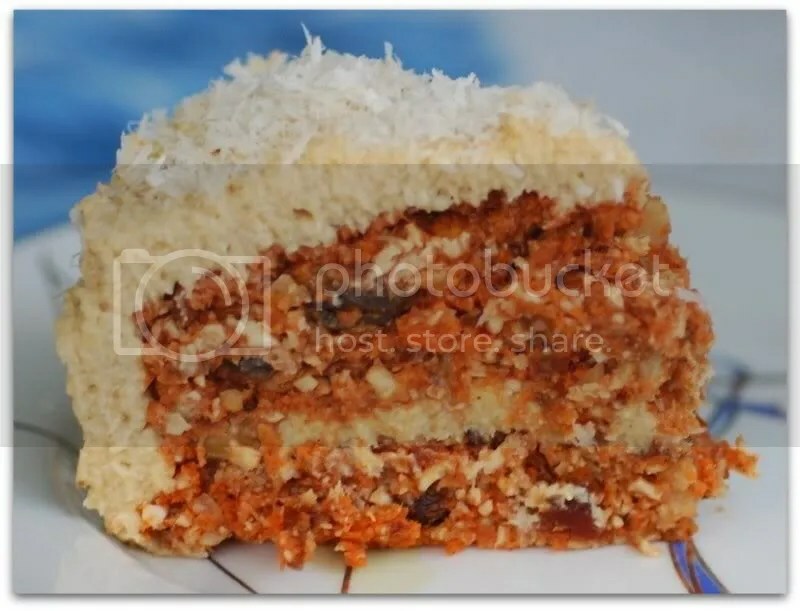 The carrot cake photo is driving me crazy with hunger! Your raw meal looks delicious. I love the brightness of the carrot cake! Do they use a lot of hard-to-find ingredients in Living Cuisine? I can’t even tell that the carrot cake is raw! It looks so beautiful! I love raw posts! Yeah! 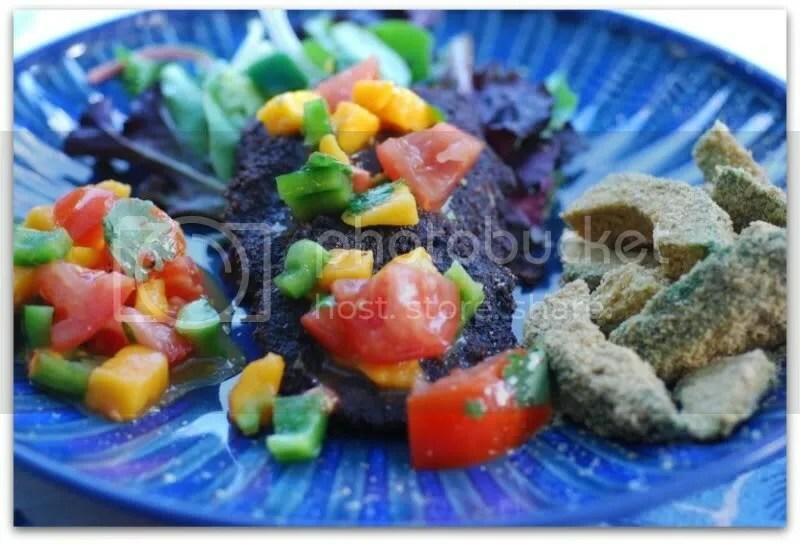 I am most definitely going to try that burger recipe – sans dehydrator – for my next Raw Tuesday! Walnuts & sudried tomatoes?! Yum! That’s so cool! 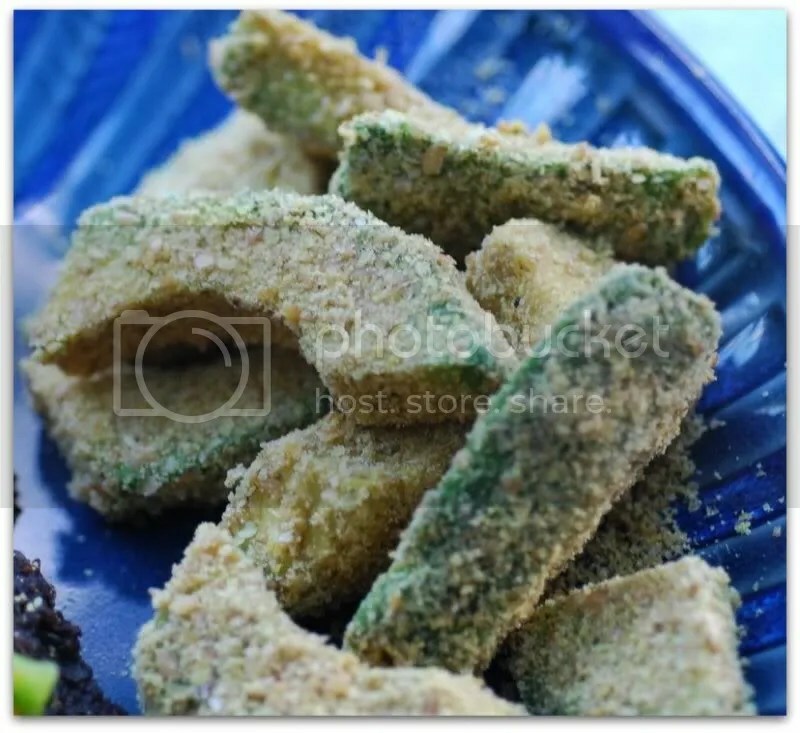 Avocado fries?! That sounds like heaven to me. The last two months I also tried to eat more raw foods. It’s summer and there are so many great fruit and vegetables, right? I also saw those burgers on the sunny raw food kitchen and wanted to give them a try. But I guess now I’ll skip them and go right for your carrot cake 🙂 Looks really delicious. I hope that everyone has a chance to try these out – they’re great!